The smell alone summons emotional reactions from deep appreciation to intense disgust. The edible flesh emits a distinctive odor that has been compared to rotten onions, turpentine, raw sewage, and gym socks. The fruit has even been banished from many hotels and from public transportation in some South East Asian countries. 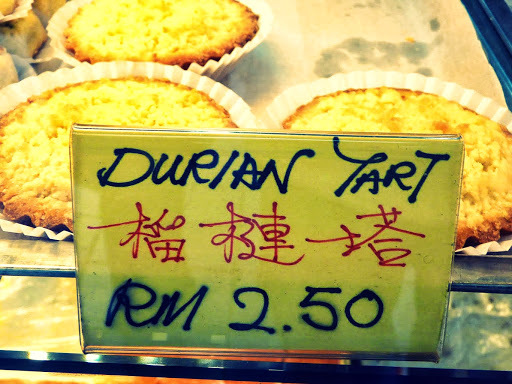 I happen to love Durian and describe the flesh as rich and custard like while being intensely flavored with almonds. The fruit is eaten by itself and also used to flavor a wide variety of both sweet and savory treats. I like it in this recipe…..
Place half the cream, vanilla bean, and sugar in saucepan and heat until sugar dissolves. Remove from heat, add remaining ingredients and mix until incorporated. Strain through fine mesh sieve. Preheat oven to 375 (190C), grease small muffin cups and line bottom and sides with puff pastry. Fill with durian mixture and bake until pastry is golden brown.